“Ninety-eight…ninety-nine…” The faithful shepherd realizes that one of his one hundred sheep is missing and sets out to find it. 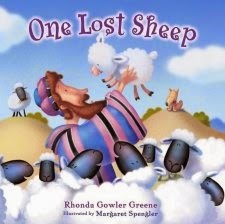 In playful rhyme, prolific author Rhonda Gowler Greene retells Jesus’ parable of the lost sheep that loses its way on the mountain side. Under brambles, behind rocks, the shepherd looks until he finds it again. Children will delight in this fun and engaging tale illustrated by Margaret Spengler as they learn that God, like the faithful shepherd, will never let them stray. My thoughts: It's always fun to get a package in the mail, and even more fun with my husband opens the mail and exclaims in happiness because we got such a cute book in the mail. And this book is definitely cute. The illustrations are darling. The words rhyme as the story progresses and is definitely useful for teaching a little about why Jesus is ecstatic over one coming to Him than the millions who are already there. I do agree with the book's age range of 4 - 8. While I think 7 or 8 years old may be a bit old for this book, the language isn't incredibly simple, so I would recommend this for a 4 or 5 year old. I will be tucking away this book for Bug for a future gift-giving occasion.